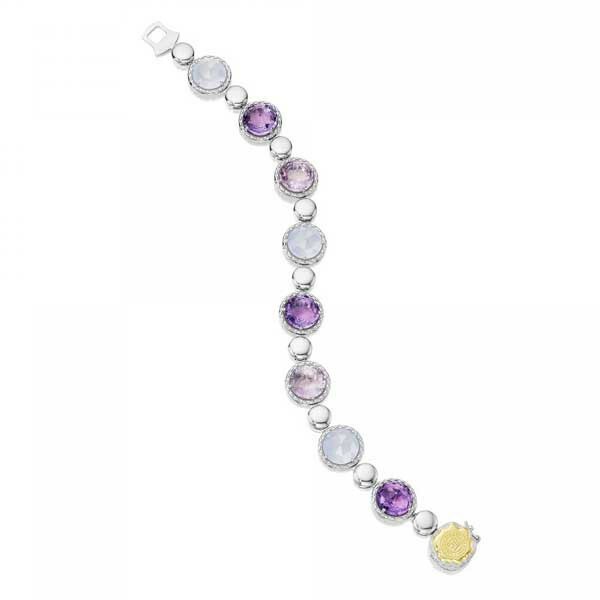 This eye-catching bracelet from Tacori is part of the Lilac Blossoms collection. It is comprised of amethyst, rose amethyst and clear quartz over white chalcedony gemstones that are trimmed with crescent engraved frames of sterling silver, and each gem is separated by a smooth sterling silver dot. Accented with an 18kt yellow gold Tacori seal, the round clasp streamlines the piece while keeping it securely on your wrist. This dazzling Tacori bracelet will accentuate your outfits with fun, flirty style.